Gov. 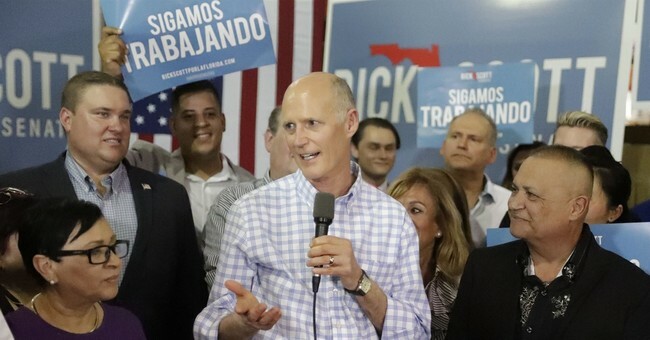 Rick Scott may have declared victory, but incumbent Democratic Sen. Bill Nelson isn't giving up. The race is heading for a recount. I'm getting closer to saying it's mathematically impossible for Andrew Gillum to bring it home. The race was tight and out of 8.1 million votes cast, a little over 34,500 votes separate Nelson and Scott. Throughout the election night, Politico’s Marc Caputo, who follows Florida politics, noted that the state continues to lean Republican—and that it was looking more and more less likely that Scott and Andrew Gillum, the gubernatorial candidate, would be unable to survive. On the latter, that was certainly true; Republican Ron DeSantis beat Gillum. As for this contest, we’ll have to wait until noon on November 10 to see who won. In June, Nelson somewhat inadvertently admitted that his campaign was in trouble, telling supporters in Pasco County, which rests near the key I-4 corridor, that this area will determine his re-election. Pasco is Trump country--and they broke for Scott 57/42. Also, a lot of Democrats interviewed by the Tampa Bay Times were Trump supporters. That's not the best indicator. As of now, it seems like Gov. Scott will have to wait three more days to declare victory. Either way, with Republicans picking off Joe Donnelly in Indiana, Heidi Heitkamp in North Dakota, and Claire McCaskill in Missouri, the GOP not only held onto their majority in the Senate, but also expanded it. Nelson’s first comments on the results: “We are proceeding to a recount."